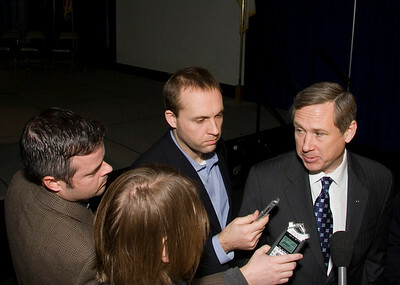 Syndicated radio host Michael Koolidge (left) asks United States Senator Mark Kirk (R-Illinois) a question after a town hall meeting at the Stenstrom Center of Rock Valley College in Rockford, Illinois on Saturday, January 22, 2011. 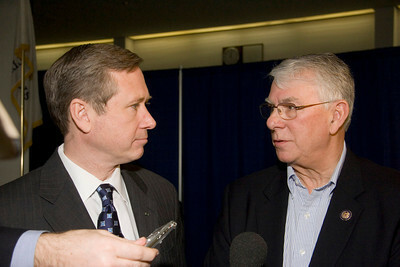 United States Senator Mark Kirk (left, R-Illinois) meets with Rockford mayor Larry Morrissey after a town hall meeting at the Stenstrom Center of Rock Valley College in Rockford, Illinois on Saturday, January 22, 2011. 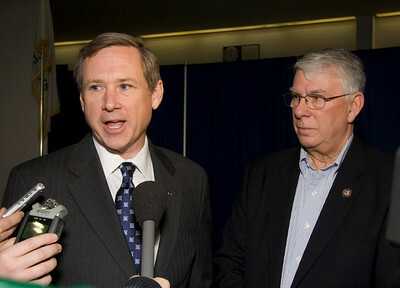 United States Senator Mark Kirk (left, R-Illinois) and Congressman Don Manzullo (R-Egan) answer questions from reporters after a town hall meeting at the Stenstrom Center of Rock Valley College in Rockford, Illinois on Saturday, January 22, 2011. 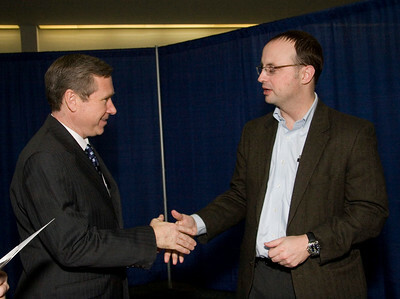 United States Senator Mark Kirk (right, R-Illinois) meets with constituents after a town hall meeting at the Stenstrom Center of Rock Valley College in Rockford, Illinois on Saturday, January 22, 2011. 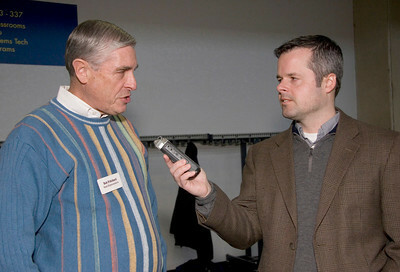 State Representative Robert Pritchard (left, R-Hinckley) chats with syndicated radio host Michael Koolidge after a town hall meeting at the Stenstrom Center of Rock Valley College in Rockford, Illinois on Saturday, January 22, 2011. 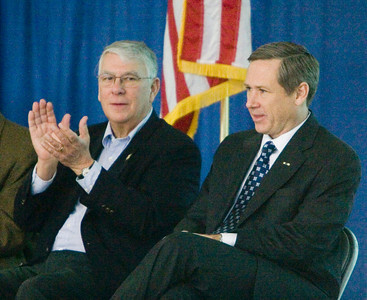 Congressman Don Manzullo (left, R-Egan) and United States Senator Mark Kirk (R-Illinois) prepare to take the stage at a town hall meeting at the Stenstrom Center of Rock Valley College in Rockford, Illinois on Saturday, January 22, 2011. 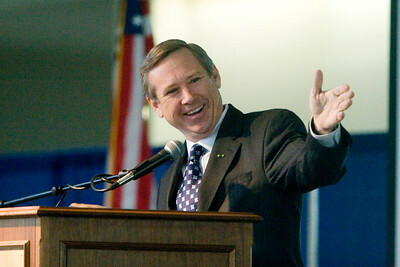 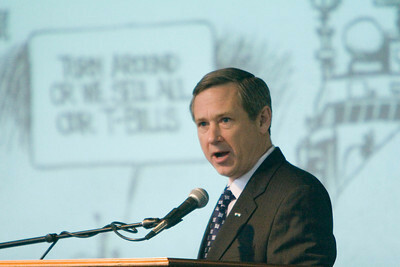 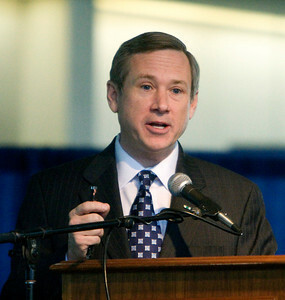 United States Senator Mark Kirk (R-Illinois) speaks at a town hall meeting at the Stenstrom Center of Rock Valley College in Rockford, Illinois on Saturday, January 22, 2011. 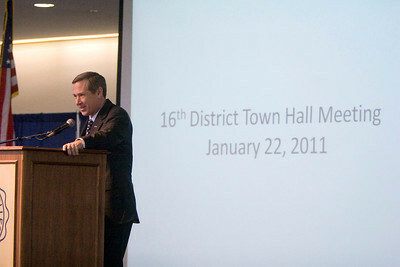 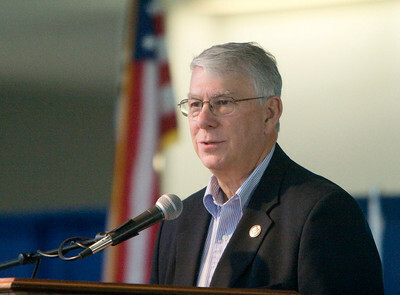 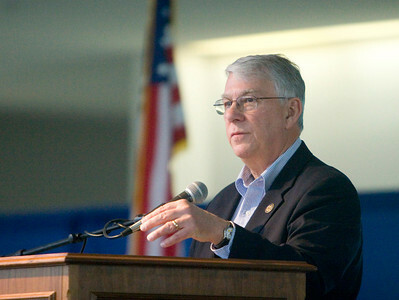 United States Congressman Don Manzullo (R-Egan) speaks at a town hall meeting at the Stenstrom Center of Rock Valley College in Rockford, Illinois on Saturday, January 22, 2011. 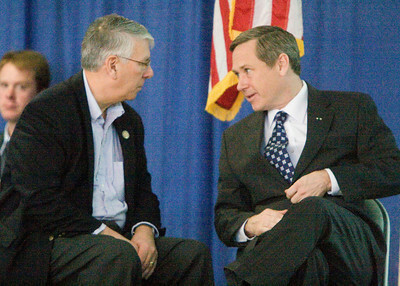 Congressman Don Manzullo (left, R-Egan) and United States Senator Mark Kirk (R-Illinois) chat briefly at a town hall meeting at the Stenstrom Center of Rock Valley College in Rockford, Illinois on Saturday, January 22, 2011. 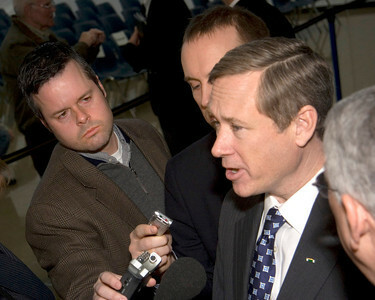 United States Congressman Don Manzullo (R-Egan) listens to a constituent's question at a town hall meeting at the Stenstrom Center of Rock Valley College in Rockford, Illinois on Saturday, January 22, 2011. 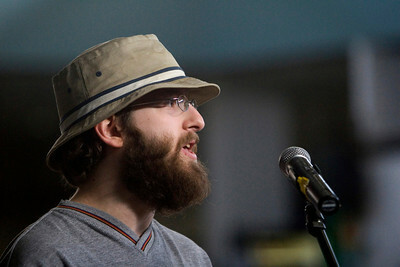 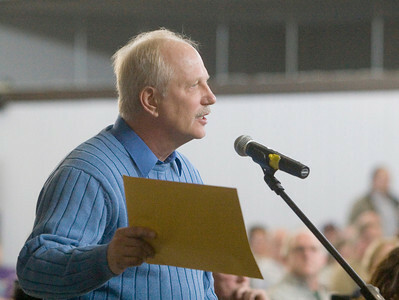 Ulysses S. Arn of Ashton, Illinois asks a question about spending caps to Congressman Don Manzullo (R-Egan) and United States Senator Mark Kirk (R-Illinois) during a town hall meeting at the Stenstrom Center of Rock Valley College in Rockford, Illinois on Saturday, January 22, 2011. 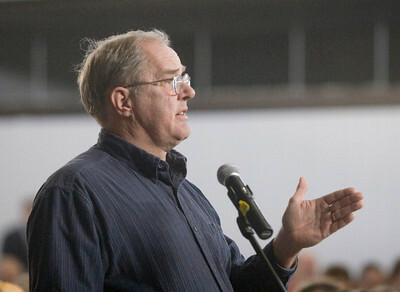 John Lieske of Machesney Park poses a question to Congressman Don Manzullo (R-Egan) and United States Senator Mark Kirk (R-Illinois) during a town hall meeting at the Stenstrom Center of Rock Valley College in Rockford, Illinois on Saturday, January 22, 2011. 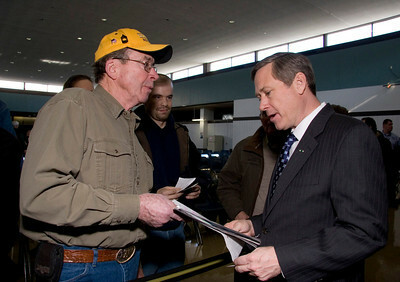 Belvidere alderman Mark Sanderson proposes reforms in pensions for public officials to Congressman Don Manzullo (R-Egan) and United States Senator Mark Kirk (R-Illinois) during a town hall meeting at the Stenstrom Center of Rock Valley College in Rockford, Illinois on Saturday, January 22, 2011. 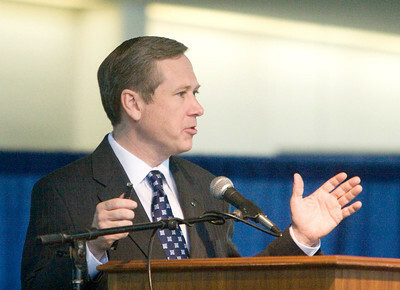 Tyechia Price asks a question about job assistance for veterans to Congressman Don Manzullo (R-Egan) and United States Senator Mark Kirk (R-Illinois) during a town hall meeting at the Stenstrom Center of Rock Valley College in Rockford, Illinois on Saturday, January 22, 2011. 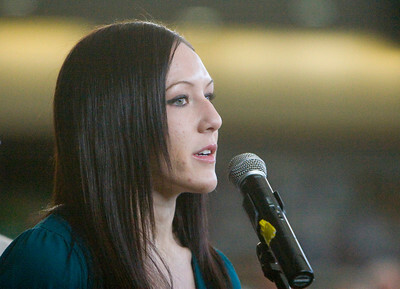 Price recently returned from her second tour of duty in Iraq.